Megan Burns is the publisher at Trembling Pillow Press (tremblingpillowpress.com). She also hosts the Blood Jet Poetry Reading Series in New Orleans and is the co-founder of the New Orleans Poetry Festival (nolapoetry.com). She has been most recently published in Jacket Magazine, Callaloo, New Laurel Review, Dream Pop, and Diagram. Her poetry and prose reviews have been published in Tarpaulin Sky, Gently Read Lit, Big Bridge, and Rain Taxi. She has four books, Memorial + Sight Lines (2008), Sound and Basin (2013), Commitment (2015), and Basic Programming (2018), published by Lavender Ink. 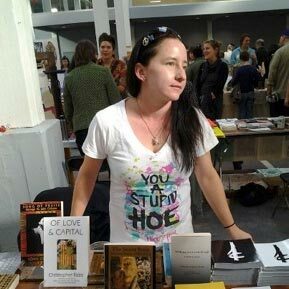 She has two recent chapbooks: Dollbaby (Horseless Press, 2013) and i always wanted to start over (Nous-Zot Press, 2014). Horse Less Press released her Twin Peaks chap, Sleepwalk With Me, in 2016. Poems rooted in geography, in landscapes where land and water collect to build memory.